42 Days at Sea! Los Cabos to Isla del Coco to Playa del Coco, Costa Rica! It has obviously been a very long crossing to Costa Rica, 36 days to Isla del Coco which was still 250-300 nautical miles southwest from mainland Costa Rica. It took us 6 more days from Isla del Coco to finally arrive in Playa del Coco, Costa Rica. As for the Crossing, overall we have just had horrible luck with the winds and currents. We started off on a good track with a storm 2 days in off of Cabo San Lucas, Baja California Sur, Mexico, which gave us some good strong northerly winds that took us about 700 miles south in the 1st week or so. Then we got becalmed with absolutely no wind for over a week. It became very frustrating especially as a 2-3 knot current developed that was always pushing us W-SW further out into the pacific. We eventually decided to motor for a bit. Since there was some engine problems with the gear box overheating it was too difficult on Karaka’s engine to motor for long. Soon enough we found some wind and made SE headway towards Costa Rica but this didn’t last for long. It was great for a few days but the current got stronger against us and even if we got a little bit of wind we had trouble making headway spending continuously spending more days drifting W-SW into the pacific. The days and weeks all kind of blended together out there as we are each in our own trance, its just a constant battle to find the wind or sit around and wait for current to start moving in our favor. There are some general consistencies with ocean weather, wind and currents but due to the sheer vastness and complexity of the oceans it is nearly impossible to know exactly where the currents are and what is going on where because the sea state is always changing depending on the weather, season, and lunar/solar cycles. There has been a lot of low moral amongst our crew because of our extremely slow process but we have managed to get along well. It is hard to spend so much time in close quarters with 6 other people without irritability forming, usually over food and water portions. We had some fuel leak into the bilge and then into our second months food storage locker and a bunch of rice, lentils, oats, chips, crackers etc have been contaminated with the taste of diesel. We went through and did a thorough clean, salvaging what we could. Another issue we are facing from being out here so long is our fresh water supply. The tank holds about 2000 litres plus another 100-150 litres in the bow and 50-100 litres in jugs on the deck. With 7 of us using the water for drinking and cooking everyday and having no idea exactly how long we will be before we can get to land and replenish our supply we had to be as conservative as possible using salt water for making bread products, pasta, rice etc in combination with the left over water in our canned veggies. We have caught a decent amount of fish, yellow fin tuna, bonito, skipjack, dorado but only when we are sailing over 3 knots and usually in the early morning or evening. With our bad luck this hasn’t been as often as we’d like. After a while of drifting around day 20ish we finally saw a tanker heading from the South to North and we spoke on the radio with them finding out that the current we were looking for was around 5 degrees North Latitude so we managed to motor for several hours when it was calm. Over the course of a few days we finally made it into this current that would take us towards the central american coast. At this point we were over 500 miles south of Guatemala/El Salvador, about 500 miles north of the Galapagos and over 700 miles from our destination in Northern Costa Rica. It felt really good to finally find this easterly moving current to help us along. We still had day after day of calm weather or very light winds slowly making headway. We were on the edge of what is called the doldrums where weather and wind is always changing, lots of squalls where heavy rain would come in short burst and the wind would blow sometimes really hard and then die completely. 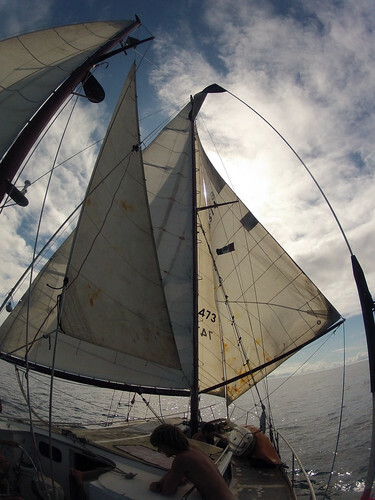 This was frustrating but when it rained we reefed the main sail and collected lots of fresh water to put in our tank. At the same time when it rained we had to deal with water leaking in through an assortment of places causing some people’s beds to get wet. On board, we kept ourselves busy by sleeping lots, reading, writing, watching movies, repairing ripped sails, and an assortment of other projects. Our course starting taking us into range of Isla Del Coco we we struggled for another few days to a week to make it there for a little rest, fill water, do some further sail repairs, ask about getting some special oil for the gear box, more fuel and maybe some food. We finally made it close to Isla del Coco on January 15th and we were around 20 NM that morning but with our still aggravatingly slow progress were we not going to make it there before dark. It was also frustrating because we finally had good wind but we hove two for the night and just drifted around within a few miles of the island. At first light we sailed in. The island was absolutely beautiful! There were boobies flying everywhere and there were countless waterfalls with big lush green cliffs. We pulled into Chatham Harbor on the NE corner of the island at around 6am. There were 3 other boats there all commercial dive boats out of Punta Arenas. Within an hour or so of picking up the mooring, the ranger boat came to talk with us. As we expected we were not permitted to stay but were granted 24hrs to repair our sails, get water etc. We were also told we couldn’t partake in any touristic activities because we didnt have a permit. Even if we wanted to buy permits for $25 a day per person plus a boat fee the only way we could get them would be in Costa Rica beforehand but if you come directly from any other country or just show up without pre arranging permits you can’t just check in and get them on the island. Silly rules but the park rangers were pretty relaxed they just said what they had to as super attendants to to island. Immediately upon arrival we were in the water swimming with the abundant fish a few small sharks who were checking out our boat. Soon enough we went to meet the attendants in the cabin on shore where we could get fresh water. They were really nice and relaxed and we chatted for a while in Spanish it was good to practice again. It felt so good to walk on shore for the first time in 36 days! They had a beautiful coconut palm surrounded cabin with satellite internet and all. They gave us some fresh bananas and we returned to the boat. It started to rain pretty hard and continued for several hours through the afternoon. It was frustrating because we wanted to go back and enjoy whatever we could of the island. Eventually we decided to put the kayaks in the water and we went back and checked some email to make sure our families/friends all knew we were fine. So apparently the spot tracker cut out again on this trip as we were out of range for about 2 weeks. We hiked up to the lookout on our last day and did some more paddling around the Chatham Bay on the northeastern side of the island. It was absolutely beautiful! So many waterfalls at every corner and such lush jungle everywhere. There are wild pigs and cats and even deer on this small extremely isolated island we saw a few of them on our paddles and hikes. We ended up buying some fuel off one of the dive boats in the harbour and Cesar traded some tequila for a ridiculous amount of meat and some fruit, bread and eggs. We ate a lot for the last 6 days, too much meat because we had to eat it before it went bad since we didn’t have any refrigeration on board. The last week just flew buy, we motored a lot so we would arrive in Playa del Coco as soon as possible. The final night we had some intense winds to help push us through the counter current and we arrived at 3am the morning of January 23rd, 2013.
stay tuned for pictures, i hope to be able to upload them here. Internet is slow though. This entry was posted in Sailing and tagged calm, costa rica, isla del coco, karaka, Mexico, offshore, Sailing by zkruz. Bookmark the permalink. sweet. we were starting to get a bit worried. glad you are here. i’m in san jose, awaiting word.